This grant is responsible for improving mobility for seniors and individuals with disabilities by removing barriers to transportation service and expanding transportation mobility options, according to the department of transportation. 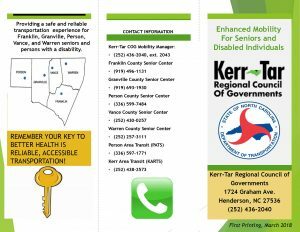 This program supports transportation services planned, designed, and carried out to meet the special transportation needs of seniors and individuals with disabilities in all areas – large urbanized (over 200,000), small urbanized (50,000-200,000), and rural (under 50,000). Eligible projects include both traditional capital investment and nontraditional investment beyond the Americans with Disabilities Act (ADA) complementary paratransit services. For a general overview on the 5310 grant, please click here. 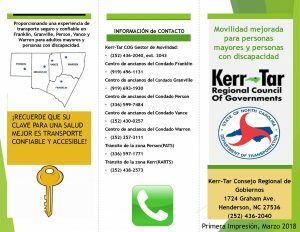 See Kerr-Tar Regional Council of Governments adopted 5310 Grant Board Resolution.